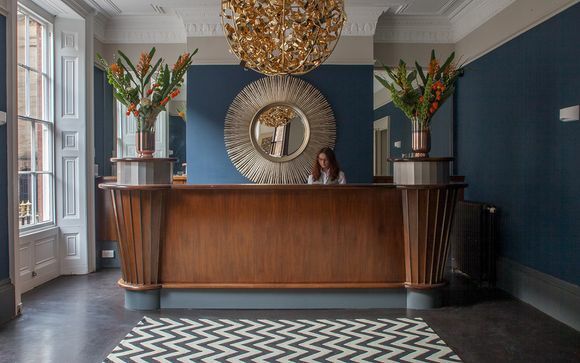 Lace Market Hotel boasts an eclectic mix of style, with sophisticated interiors and amazing artworks. This Georgian Townhouse is situated in the heart of Nottinghams trendy Lace Market district, this area is part of the 'creative quarter' a hub for art theatre and entertainment. Merchants Restaurant is the statement piece of this hotel with 2 AA Rosettes, alongside the Saint Bar with a chic marble bar and atmospheric lighting. Lace Market Hotel the original Georgian Townhouse Style Hotel is situated right in the heart of the city of Nottingham’s trendy Lace Market district. Once a hub for the world's lace trade, this characterful area of Nottingham has been transformed into a fashionable spot. Just minutes away is St Mary’s Church, the Galleries of Justice, and the historic Shire Hall, only 5 minute walk from Nottingham train station and 2 minute walk to the main shopping centre, café's and bars. The Capital FM arena and national ice skating arena is also a 5 minute walk. 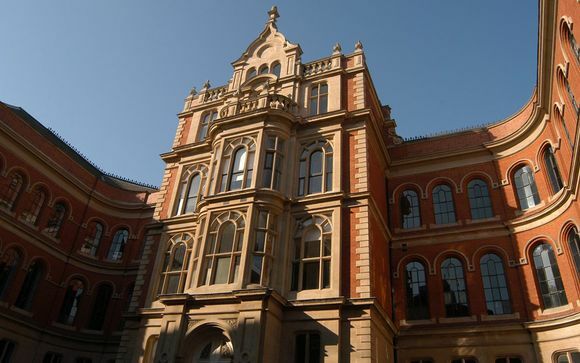 The Lace Market area is part of the 'Creative Quarter' of the city which is Nottingham's hub for innovation, enterprise & creative business activity along with art, theatre and entertainment. Of course, as the heart of the legendary Robin Hood story, where better to dscover the story and as you go through the city you'll find many a mention to it. A well kept secret is that Nottingham is built on more than 500 man-made, sandstone caves dating back to medieval times. Descend far below street level and discover how the caves were used as tanneries, bomb shelters and homes from the expert guides or on an audio tour, promising a walk around Broadmarsh Shopping Centre like no other. The elegant decor features chandeliers and leather furniture from the welcoming reception to the refined bedrooms. The hotel offers the award-winning Merchants restaurant, as well as an in-house pub and a cocktail bar. A wide array of restaurants can be found in the surrounding area. Guests can enjoy their breakfast in the comfort of their own room. Explore the vibrant surrounding streets filled with historic buildings and plenty of shopping and entertainment venues. All the spacious and bright rooms at the Lace Market are individually designed and include flat-screen TVs, allergy-friendly bedding and minibars. Most rooms boast large floor-to-ceiling windows with spectacular views while the contemporary bathrooms feature Orla Kiely products. For some extra space that is just as luxurious choose a Deluxe King Double. This offer is based on a bed and breakfast stay. You may choose to add 3-course dinner option to your board basis which will be a set menu. With a relaxed flair and a charming ambiance, Merchants Restaurant provides the epitome of fine dining with 2 AA Rosettes. Built into a spectacularly converted former textile mill and renowned for its sublime décor, Merchants is one of the most beautiful restaurants in the city. Recently refurbished to deliver a fresh look and a new lease of life the restaurant strikes a powerful chord within Nottingham's food scene. The sumptuous interior hints at the high standard and class of the food served by the restaurant. 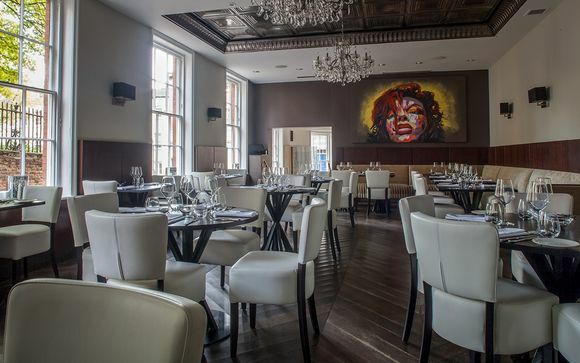 Featuring ornate chandeliers, large modern canvas artwork and elegant leather seating, Merchants provides a sophisticated contemporary design; a true feast for the eyes! While you're waiting for your sumptuous dinner why not sip a drink in Saint Bar, a sophisticated inner city bar adjoining Merchants Restaurant with a great selection of spirits and beers but the bar really excels at exquisitely concocted cocktails. Great pub food and ale work side by side to create a great city centre pub, the epitome of all things British.